It’s getting hard to keep up with all the series on Netflix. 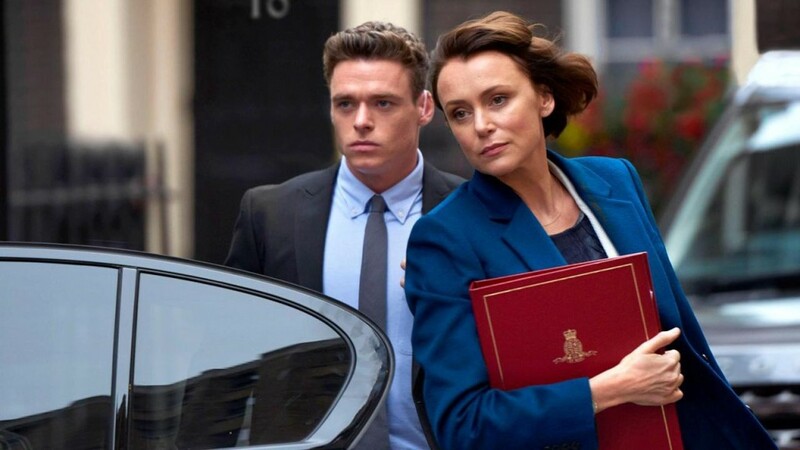 The latest one is the British import “Bodyguard” (Netflix, streaming) a series about the intersection between a war hero (Richard Madden) hired as security for the Hoe Secretary (Keeley Hawes) with whom he may have some differences. The six-episode drama from Jed Mercurio of “Line of Duty” set ratings records during its recent run on the BBC. Judging from Game 1, if you want to watch Game 2 of the Dodgers at Boston (Fox, 8 p.m.) in the World Series, you better expect to be up past midnight. Humans have enough awards shows. But there aren’t many for canines, so here’s the 2018 American Humane Hero Dog Awards (Hallmark, 8 p.m.), awarding various Lassies of the day. It’s cats who get the spotlight on “Nature” (PBS, 8 p.m., check local listings), with an episode on cheetahs, snow leopards, the Canada lynx and African leopards. Not as popular as either: “Top Ten Deadliest Beasts” (Smithsonian, 8 p.m.). “Full Frontal with Samantha Bee” (TBS, 10:30 p.m.) will try to whip up midterm voting enthusiasm. The brief, speedy history of the Concorde, which hasn’t flown in 15 years, is recounted on “Nova” (PBS, 9 p.m., check local listings). The church is not entirely welcoming on “Welcome to Waverly” (Bravo, 10 p.m.). Not sure why people are so loyal to their randomly-picked original tribes on “Survivor” (CBS, 8 p.m.). “The Goldbergs” (ABC, 8 p.m.) meet Freddy Krueger. IT’s Halloween, too, on “American Housewife” (ABC, 8:30 p.m.) , “Single Parents” (ABC, 9:30 p.m.) and “Modern Family” (ABC, 9 p.m.) where there may also be the death promised this season (the logline describes “huge, unexpected news” in an episode titled “Good Grief”). On “All American” (CW, 9 p.m.), Spencer and Jordan spend an unexpected day back in Crenshaw. Surviving traits of the “Neanderthal” (PBS, 10 p.m., check local listings) are investigated. Will feels forced to lie to Natalie on “Chicago Med” (NBC, 8 p.m.). In the first of a two-part episode “SEAL Team” (CBS, 9 p.m.) is dispatched to Mumbai to rescue a foreign service officer being held hostage. On “Criminal Minds” (CBS, 10 p.m.), a ritualistic murderer is sought in Tallahassee. A trailer park blaze is investigated on “Chicago Fire” (NBC, 9 p.m.). Ruzek finds his father is working for a drug dealer on “Chicago P.D.” (NBC, 10 p.m.). Gary goes on a date with Maggie on “A Million Little Things” (ABC, 10 p.m.). “American Horror Story: Apocalypse” (FX, 10 p.m.) reaches its high season. On “Are You the One?” (MTV, 10 p.m.), Brett second-guesses going with someone named Nutsa. The opening of the speakeasy is delayed on “Riverdale” (CW, 8 p.m.), which makes sense since this is a high school series. There’s Southern Cooking and a fight on “The Real Housewives of Dallas” (Bravo, 9 p.m.). They’re melting down metal sculptures to make their blades on “Forged in Fire” (History, 9 p.m.). Bela Legosi is star on Turner Classic Movies in “White Zombie” (8 p.m.), “Mark of the Vampire” (9:15 p.m.), “Night Monster” (10:30 p.m.), “The Human Monster” (midnight), “The Devil Bat” (1:30 a.m.), “The Corpse Vanishes” (2:45 a.m.), “Spooks Run Wild” (4 a.m.) and “Bowery at Midnight” (5:15 a.m.). The rest of the day is devoted to World War I flying aces in “The Lost Squadron” (6 a.m.), “Flight Commander” (7:30 a.m.), “Ace of Aces” (9:30 a.m.), “The Eagle and the Hawk” (11 a.m.), “Today We Live” (12:15 p.m.), “Suzy” (2:15 p.m.), “The Dawn Patrol” (4 p.m.) and “Flight Command” (6 p.m.). NBA action includes Dallas at Atlanta (ESPN, 7:15 p.m.) and Philadelphia at Milwaukee (ESPN, 9:30 p.m.). Hockey has Toronto at Winnipeg (NBC Sports, 7 p.m.) and Tampa Bay at Colorado (NBC Sports, 9:30 p.m.). Women’s college volleyball includes South Carolina at Tennessee (ESPNU, 7 p.m.) and Texas at Iowa State (ESPNU, 9 p.m.). Kelly Ripa and Ryan Seacrest: Greg Kenner, Tracey Ullman, Elle King. The Talk: Carey Mulligan, Katie Miller, Meredith Vieira. Ellen DeGeneres: Jason Sudeikis, Lauren Daigle. Wendy Williams: Rev. Al Sharpton, Judge Lynn Toler. The Real: Iain Armitage, Monica. Stephen Colbert: Gerard Butler, Rowan Atkinson, Ina Garten. Jimmy Kimmel: Carey Mulligan, Kevin Nealon, Lukas Graham. Jimmy Fallon: Greg Kenner, Paul Dano, Steve Kornaki, Hozier with Mavis Staples. Seth Meyers: Jonah Hill, Emily Van Camp, the Avett Brothers. James Corden: Rosamund Pike, Zlatan Ibrahimovic, Snow Patrol. Carson Daly: Beth Behrs, Lawrence, Richard Cabral.